With the new apartment, I have an opportunity to float my furniture in the room vs. placing all of the pieces up against the wall. One new piece of furniture that I will be purchasing is a console table to go behind the couch. I am loving CB2's Sol console table. The bright yellow color and simple lines will really compliment our gray couch and add a pop of color in our more neutral palette. 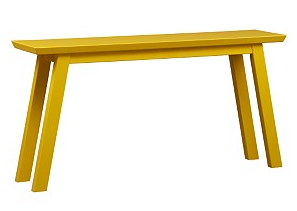 5 Responses to "CB2's Sol Console Table"
Hello, your blog is so good. Very inspiring. Crate and Barrel is the best!